The stability and variability of pH in hydroponic solutions has always been a complicated topic to discuss. There are many reasons why pH may change in a hydroponic system, ranging from the media being used, the micro-organisms present and the amount of carbon dioxide in the air. However the most agressive contributing factor in a healthy hydroponic system with no important pH altering media is plant nutrient absorption. Today we are going to talk about this and how the ratio of ammonium to nitrate heavily affects plant nutrient absorption. As I have discussed in the past in my blog, plants will always compensate ion absorption by releasing a pH altering ion of the same charge. If a plant absorbs nitrate (NO3-) it will release an OH- ion in order to balance the charge. This ion will increase the pH. The same happens when the plant absorbs a cation - like K+ or Ca+2 - as it will release H3O+ ions in order to compensate (one in the case of K+ and two in case of Ca+2). However plants do not absorb all ions equally and therefore if there is more cation than anion absorption pH will decrease while in the opposite case pH will increase. The image above shows how plants usually distribute their cation/anion absorption. In the case of anions the largest contributing factor is nitrate while in the case of cations the largest contributions come from potassium and calcium. Since adding ammonium to replace nitrate will cause the balance to shift to the cation side we can indeed cause the pH behavior to change significantly by changing the ammonium to nitrate ratio. For many plants - especially fruiting plants like tomatoes or cucumbers - the ideal ammonium to nitrate ratio has been established to be around 2:8 and this usually implies that pH will tend to increase as a function of time since the amount of anions absorbed will be larger. Using larger ammonium to nitrate ratios - like 5:5 - may bring you more pH stability but this may be at the cost of crop productivity. 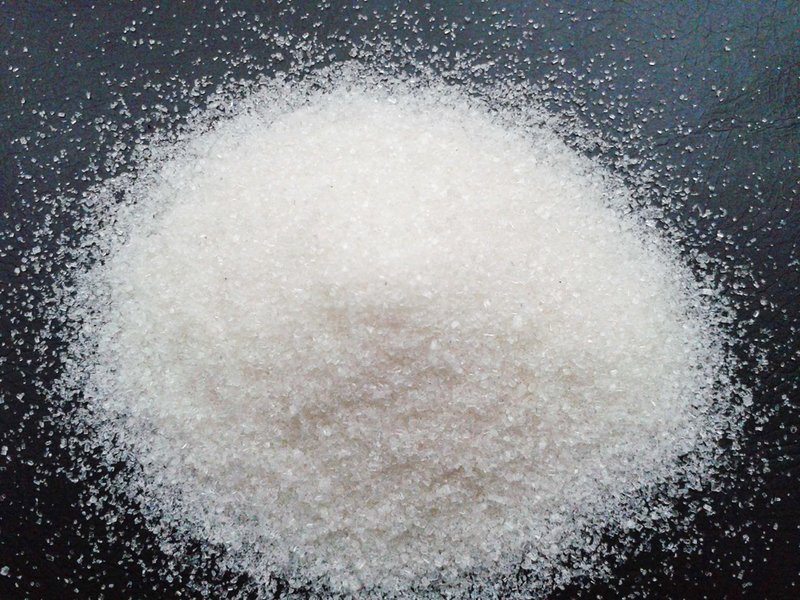 If you want to increase the amount of ammonium in solution ammonium sulfate (shown below) is usually the cheapest source. Adding 0.05g/L (0.18 g/gal) will increase your NH4+ concentration by around 10 ppm. It is also important to note that you cannot easily affect ion absorptions by shifting solution concentrations. Ammonium affects the pH quite directly because adding more ammonium to the solution almost immediately adds that ammonium to the plant's cation absorption - because it's taken up very readily - but adding other cations might not increase their absorption because either environmental or plant regulatory mechanisms may stop this from happening. For example increasing potassium may not increase the overall size of the cation absorption column because the plant might simply compensate by reducing calcium absorption. Such a compensatory mechanism does not exist for ammonium, reason why it is so effective in changing the relative size of one column against another. In the end the nitrate/ammonium ratio is perhaps one of the biggest weapons you have in controlling how your plants change the pH of your nutrient solution. However aiming for the most stable pH - in terms of cation/anion absorption - might not be the best bet since this might reduce your crop's yield. At optimum nitrate to ammonium concentrations most crops tend to experience some moderate pH increases as a function of time. Nonetheless different crops respond to ammonium to nitrate ratios differently so you might want to give different ratios a try to see what works best for you, both in terms of yields and easiest crop management. Thank you It was very useful and technical like other posts.